To be completely honest, this probably wasn't exactly the ending of an era so much as the end of the first year of Connor's life. Something I looked forward to after we started using bottles was being done with bottles. And even more so being done with formula because that meant we didn't have to buy all that formula which can get pretty costly. 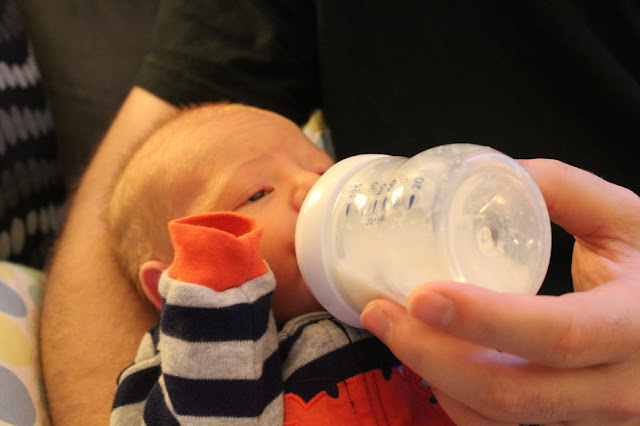 I knew that I more than likely we were going to be using bottles and formula again. 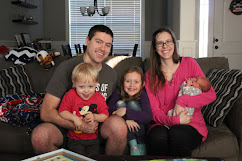 With Addie, I struggled for three months (including one month of exclusively pumping) before we switched to formula. I just didn't have enough. So I knew going into this that more than likely I wouldn't be able to breastfeed Connor for very long. And this time I was okay with it since I felt like I was starving Addison last time. So for the last year (minus those three weeks) we have been using bottles and buying formula - not cheap by the way. We have spent countless time washing bottles and mixing bottles. So there wasn't any part of me that was sad to give that up. Except that my little boy is growing up. He doesn't need what formula gives him anymore. That means he's getting big and growing up. We finished with formula and bottles about a week after he turned one. We had a little extra formula and wanted to finish it up. And since we didn't have much left it didn't take long to finish it. But I was definitely nervous about being done with bottles. I had no idea how he would do at bedtime and naptime. Normally he gets a bottle when he gets up then another bottle before nap time and a third at bedtime. He finishes his bottle, cuddles up and we are easily able to put him down. We even had some nights where the only thing we could do to get him back down was to give him another bottle in the middle of the night. I scaled back on the bottle at nap time and it seemed to have had no impact on his nap, which definitely a relief. We had a small bedtime bottle and still no impact. And by the next day there was no bottles at all and he still went down great and slept great for both nap and bed times. So that was just it. The transition was easy and painless. One day we had bottles and formulas and the next day we didn't. Now getting him to actually drink whole milk has been a bit of a challenge since he doesn't seem to like the whole milk. I read that it isn't as sweet and that definitely has an impact on his wanting to drink it, but we offer every day and hopefully he'll come around. The biggest thing is that my little boy is growing up and he is no longer having bottles and formula.